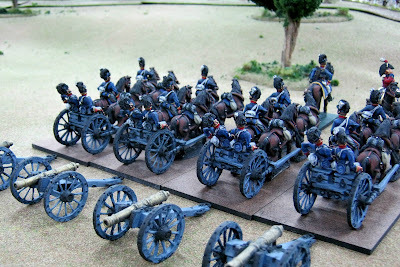 For this story Der Alte Fritz (Jim P.) and I are moving our Napoleonic game activities to the blog Campaigns In Iberia. Situation: An outnumbered British force at first stands to fight and then must scramble to the Coa River Bridge to escape. There is a problem but not like you might think. 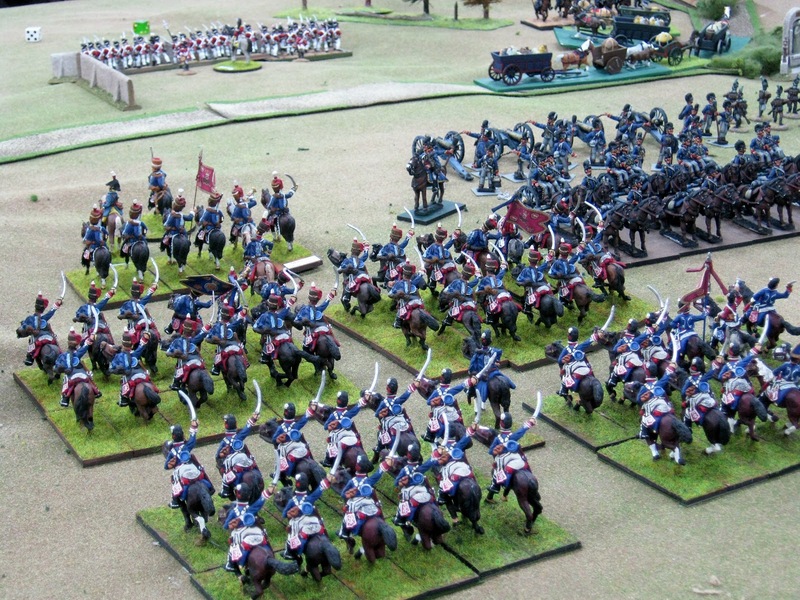 When gaming pards become highly skilled in deployment, maneuver and rules, it becomes harder to surprise each other. Unforeseen and entertaining blows become fewer and fewer because both sides have become nearly evenly matched. Parries are frequent. We know each other too well. One more thing and this is BIG. As players we tower above the tabletop seeing everything. It therefore becomes even easier to counter enemy plans. Legerdemain almost entirely vanishes. Players on one side often huddle to change plans, move reserves or do just about anything to impossibly stop the foe in unrealistic moments. The solution is to introduce Tactical Orders and Couriers. What does this entail? 1. Each player is given a mission such as take the hill, use refused wing tactics, swing wide right, hold the village area, etc. These are Tactical Orders. Obey them. 2. Each player is represented by a miniature officer. You as that miniature officer will honorably make decisions only about what that little fellow can actually see or be told down on the table. 3. Each player will have couriers to send orders, information, ask for help, etc. It is important couriers are well-mounted and skillful riders simulated by double or treble light cavalry open order speeds. Thus, if centrally placed commanding General Alexander perched atop a high hill can actually see a dangerous enemy move on a flank, he can write a message, fold and place it under a courier and send off the galloper to the reserve to order a static regiment to the flank to help. The officer receiving the message can react the turn after receipt. Let's see how this was reflected in the following game. Stand quietly boys and do your duty. Two kilometers to the left of the quiet Coa River Bridge is the Fortress of Almeida. 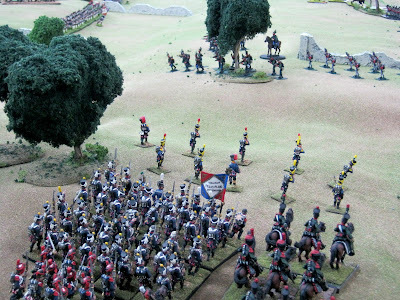 Between the two we played a fun, stimulating and companionable 1:10 Napoleonic game in Iberia. 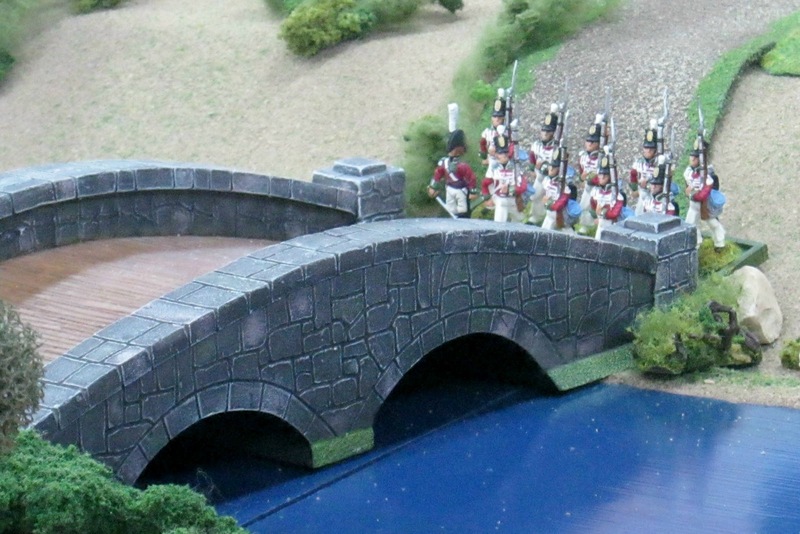 This bridge was British extreme right flank. 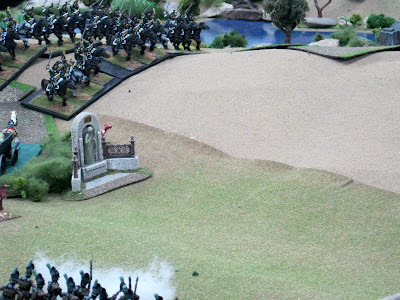 Meanwhile near Almeida French line infantry and chasseurs a cheval busily approach the British extreme left flank held by riflemen. 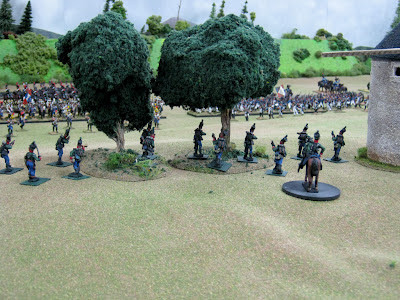 The same riflemen view the French advance. Deeper inside the left flank is Der Alte's new 94th Regt. Note distant riflemen of the previous two images. 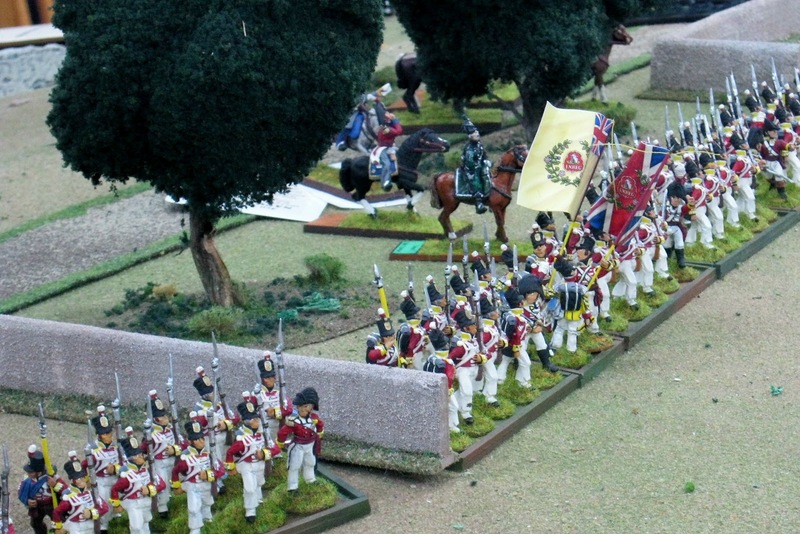 more riflemen and the 9th Regiment. A later view of the same rifles and the 9th Regt. Better view of the 9th. Regt. British Horse Artillery Battery on the unopposed right flank. 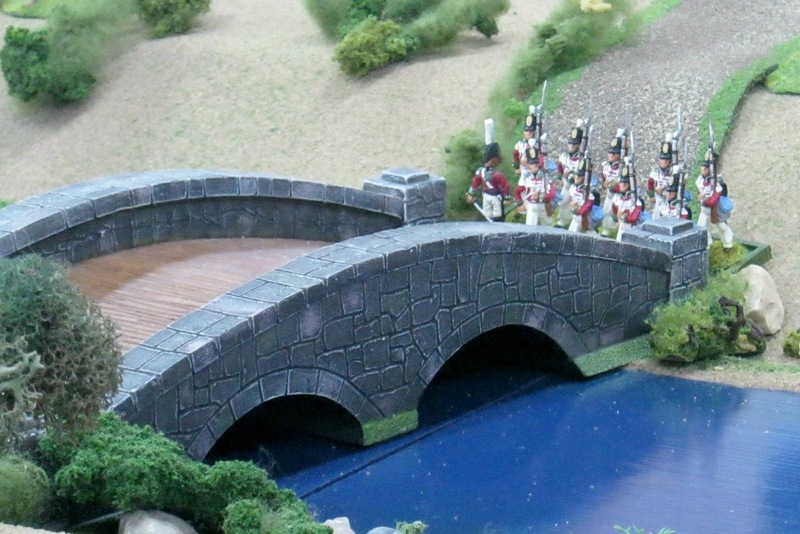 The Coa River Bridge on the extreme right flank. 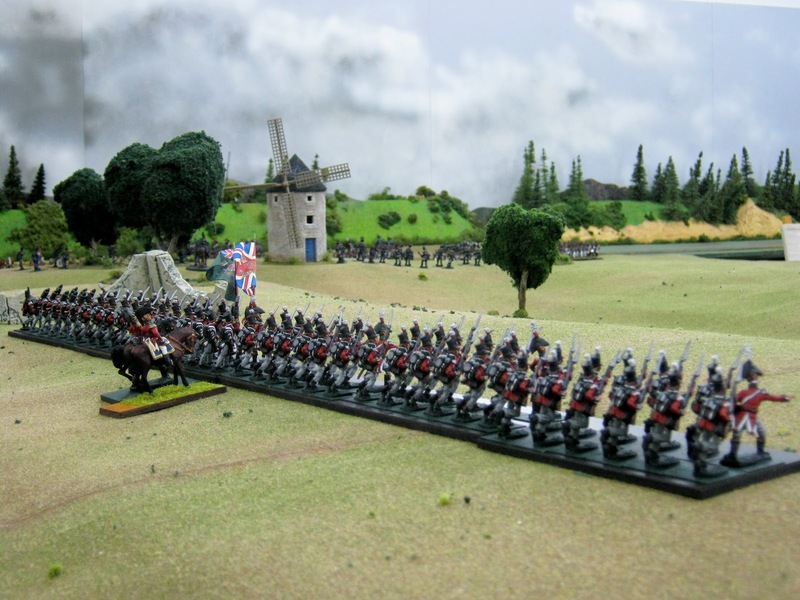 In the beginning French forces were not allowed to deploy opposite the British right flank. They instead deployed opposite the British left and center. 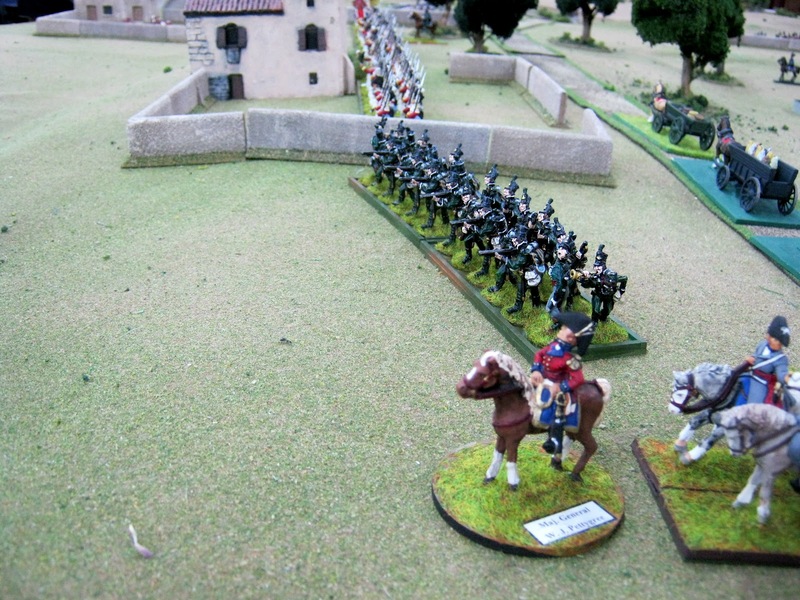 Reasons were because French numbers nearly doubled those of their foe. The British did not need the French appearing everywhere! Plus, the French were not initially posted there historically. That soon changed. 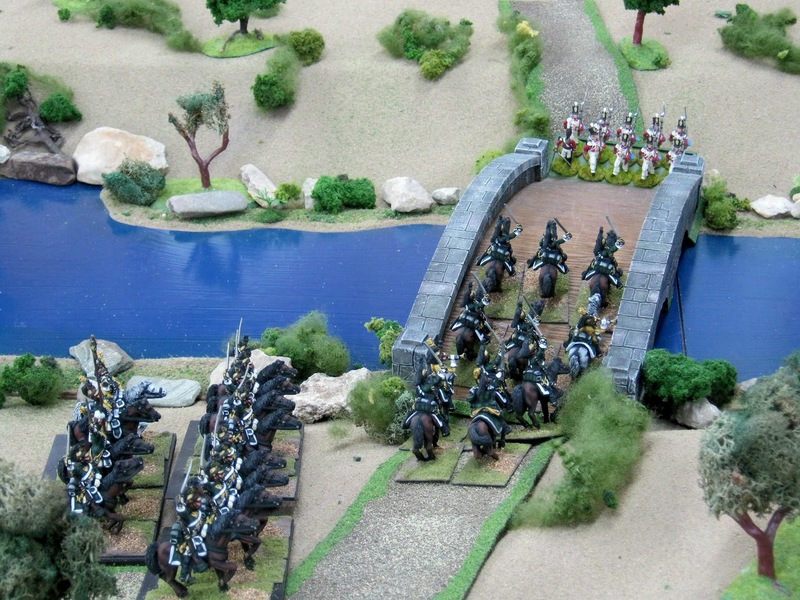 As Polish Lancers shockingly arrived to disrupt a supply train heading for the bridge. The bridge is to the upper right of the image less than two feet away. 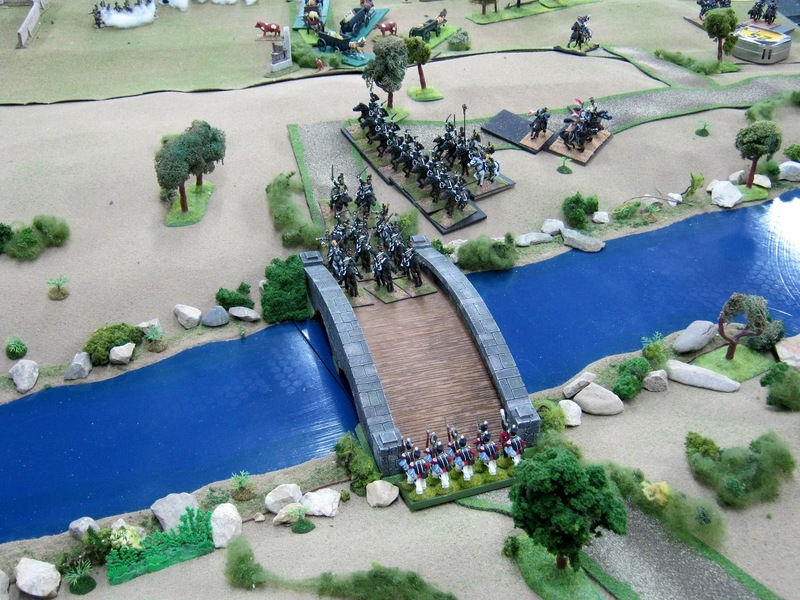 They were followed by two squadrons of French dragoons making for the bridge. You can just see a corner of the bridge in the upper right of the photo. One squadron then turned to canter up and over the bridge. Would the other squadron follow and burst through Captain Magoo's unsupported Grenadier Company? 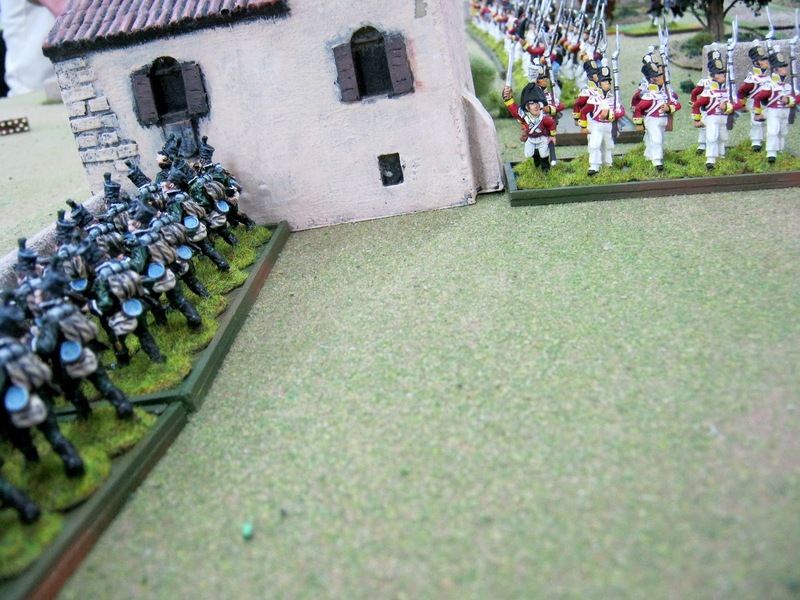 Afterwards would the French dismount closing the British escape route? 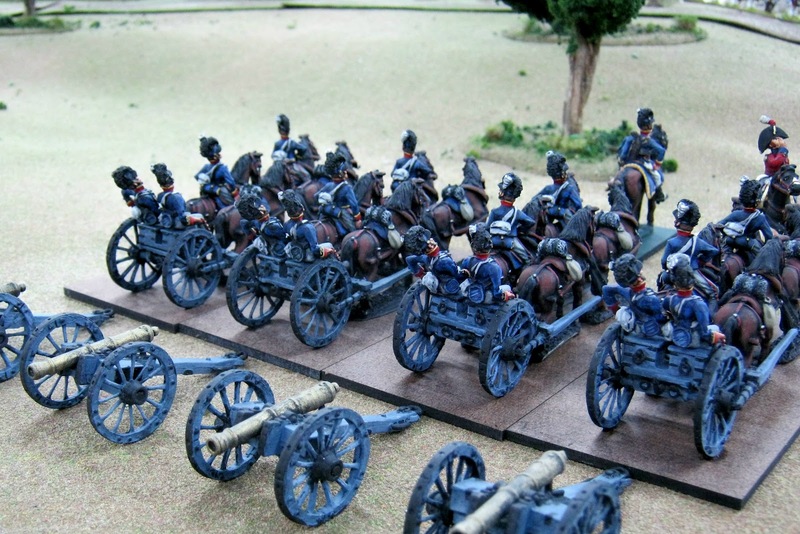 The horse artillery battery to move forward and deploy to protect the right flank. Note the courier in the upper right of the photo. 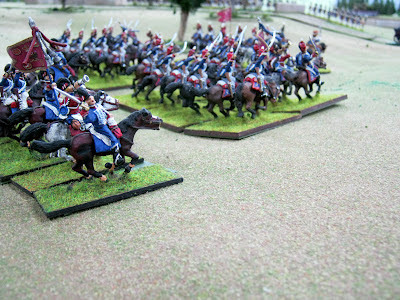 The courier delivered the information and then rode to the rear several more feet to advise Lord Paget to bring his British light cavalry forward as well. Lord Paget obeyed. The 15th Hussars led the 16th Light Dragoons from the British Back Table to the Main Table on Turn 4. 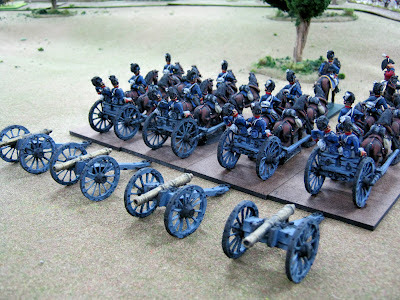 On about Turn 5 the artillery is unlimbered and the light cavalry has arrived to act. Here's the thing. As Bill, I knew French regiments of cavalry were heading for the British right flank on Turn 2. 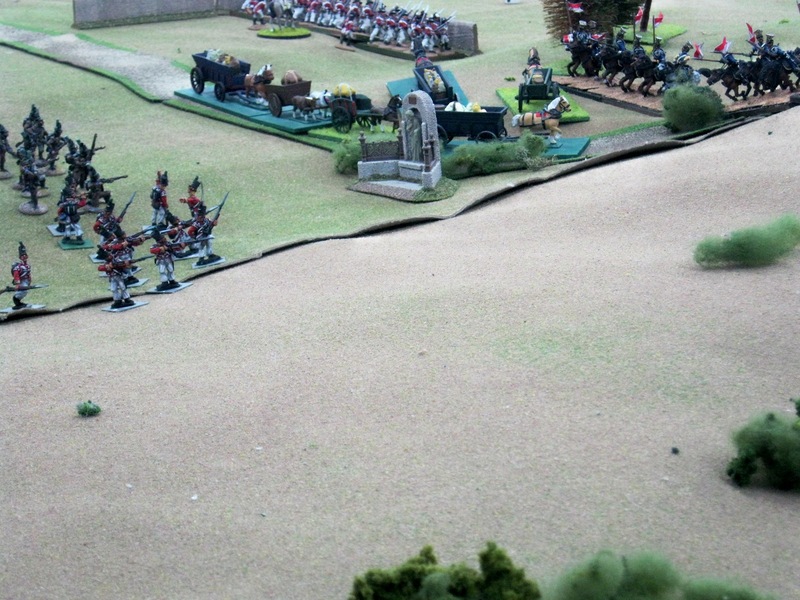 I could have shifted the artillery and Paget's cavalry earlier than turns 3 and 4. I did not because the officers on the table had to discern what was happening from their perspective an inch above the table, a courier needed dispatching and recipients needed time to react. Thus, real world reasonable delays were built into my response. 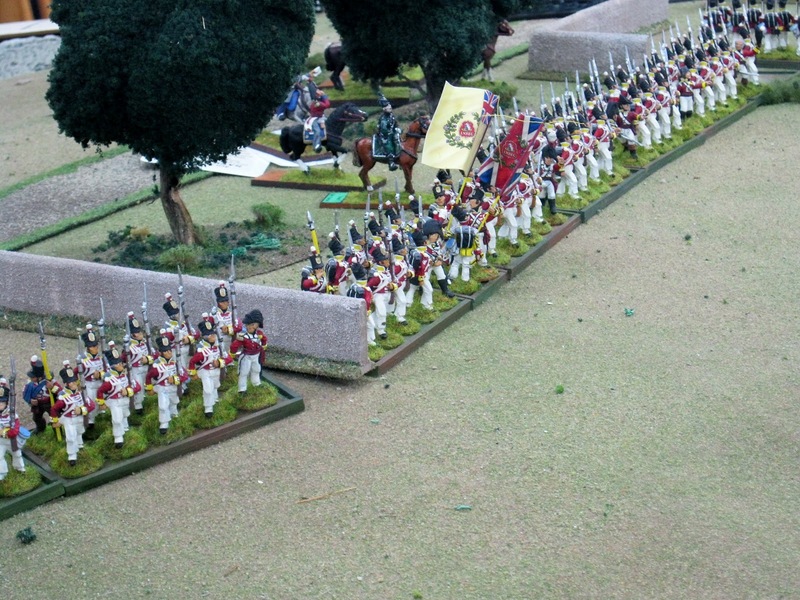 As a result, Captain Magoo's grenadiers were feeling very isolated and lonely. Nobody else was there to stop a French breakthrough. Had I not played the game with delays described, this moment would never have happened. Paget would have gotten here before the French dragoons cantered onto the bridge and this exciting moment would never have occurred. Come back next time to see what happened! 1) Some of the information for our scenario was personally provided by Charles Grant, "from his next publication, Wargaming in History - Peninsular Actions - which will be out well before Chritsmas." Jim and I sincerely thank him for our adaptation of his Coa Bridge scenario. We like this scenario so much we plan do it again in two months. Seven players are needed for our version. 2) See: http://www.napoleon-series.org/military/virtual/almeida/c_almeida.html for information about The Fortress of Ameida and its geographical and tactical importance in the region by Robert Burnham. 5) Your remarks are very welcome at "Comments" below.